Wilson, Jon. 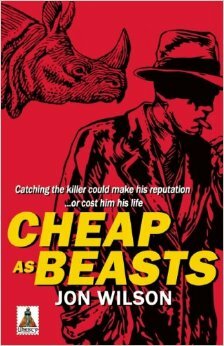 “Cheap as Beasts”, Bold Strokes Books, 2015. After serving in the armed forces during World War II, Declan Colette has been trying to make a living as a private investigator but he has issues—drinking is one and dealing with danger is another. When a girl sets an appointment for a consultation and is murdered on her way to him, the police tag him as their prime suspect. He knows that the only way that he can clear himself is to find the real murderer and this puts him up against a rival detective firm, a very rich family and an enemy who began his trail of crime back before the war. He also knows that solving this case could build his reputation but losing it could mean losing his life. Colette’s problem is that people do not seem to know that he exists. He finally almost got a break when he is hired by a wealthy family to prove that the stepmother killed the father of his clients but before he could even get started on the case there was another murder in the family and he is hired to handle that. Unfortunately Declan Colette does not have too much going for him. He is gay and Black, not particularly skilled as a detective and a bit of a racist and for someone who is a minority anyway this does not help him overall. He admittedly hates the Japanese and the Germans as a result of his time in the service. Yet he is quick to stand up for Black people but seems to have little regard for too many others. The fact that he is gay at a time when they were very few out gay men does not help either. Remembering the time that this takes place could be the reason that there is not romance in this novel. I am not much of a mystery reader but when I do read a mystery I want to hope that things will add up nicely and that when a book is finished, a crime is solved. I am just not sure that Colette had any idea of what was really going on around him and it takes to the end of the book before a lot of the mystery makes any sense. The mystery is not what propels the story forward, Colette is the force. And while I would not call him a likeable guy, I do not think it is easy to ignore him. He is a force unto himself. He is dark and filled with sarcasm but we have to consider the plight of Black gay men at that time in history. He has to deal with the obstacles of a powerful family, police that tend to throw a monkey wrench into the investigation, his rivals and the local gangsters. It is almost as if he is defeated before he begins but that is not how he does things. I suppose might says that this is a new kind of mystery novel, one in which the mystery takes a backseat to the characters yet re-emerges at the end. The novel is beautifully written even if it is confusing at times and I cannot help but wonder how long it took author Wilson to dream up a character like Declan Colette, a true individual and one of a kind. A word in closing—we do not often get too many gay novels that go back to the second World War these days—we seem to have moved on. I am glad to see this step back in time because it reminds us of how we had to live and with Declan Colette, he had a double burden of being Black and gay. We simply cannot allow ourselves to forget from whence we came. This entry was posted in GLBT fiction on February 11, 2015 by Amos.